Of all time? Well… okay… the best Blue Jackets of the last 12 years. But for a team and a city, save for a few glimpses of greatness and one short-lived playoff experience, those 12 years have been long and painful, making them feel like a lifetime. One of the greatest Columbus Blue Jackets just came home – Jody Shelley, who has lived in Columbus since joining the team in 2004. Because of this homecoming, I got to thinking, and thought I’d take a trip down memory lane for a bit. Why “of all time?” Because “of the last millennium” just doesn’t sound right. Let’s get it started with the haymakers before we jump into the play makers, shall we? 6 feet tall, 230 pounds. 380 games, 29 points and 1025 penalty minutes (PIMs). Your prototypical tough guy. But Jody Shelley was oh so much more than that in Columbus. Shelley was a true ambassador for the team, and the consummate teammate: if you had to get to one of the other Jackets, you had to go through him first. With his fists of fury, you could count on that being a tough road. I’ll be honest with you, I didn’t even know there was a rule that after 3 fights, you’re done for the night. Take a look at Shelley’s 3 round battle with Bob Probert and subsequent 4th round 2 nights later from 2002. 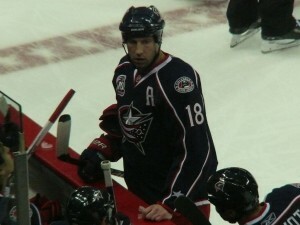 Shelley was in Columbus into the 2007-08 season when he was traded to the San Jose Sharks. Why was he traded from a team he loved so much and where the fans couldn’t wait to see him get on the ice (read: drop the gloves)? Easy – he had a protege and a team really only needs one fighter. Enter Jared Boll. I lump these two together because of their hands. Not hands like current Blue Jackets Marian Gaborik, Nathan Horton and Cam Atkinson. No, I mean the hands that pummel you into submission and leave you bloody and crying for mommy. Boll eclipsed Shelley in games played in 2013 and is now up to 388 as a Blue Jacket. At 963 PIMs, it won’t be long into this season (barring injury) that Boll should surpass the Jackets’ all-time leader in penalty minutes as well. Needless to say, these are two fan favorites that you wouldn’t want to meet in a dark alley in downtown Columbus. Only now, you must run through both – Boll on the ice, and Shelley off of it, as a broadcast associate and team ambassador. Both drafted in the 2006 draft, this pair of Dericks (Dereks?) combined for 589 games and 234 points as Blue Jackets. Dorsett was an undersized, scrappy player who averaged over 2.5 penalty minutes a game, but was befuddled by injuries throughout his career. Brassard was a consistent role player for 6 years, scoring 180 of the duo’s points. Both were traded to the New York Rangers in the trade that brought Marian Gaborik to Columbus. Having both been “lifetime” Blue Jackets, the news of their trade wasn’t exactly expected, and they were gone before Jackets fans had a chance to say goodbye. Rastislav Klesla was the Blue Jackets first-ever draft pick in the 2000 NHL Entry Draft. He was taken 4th overall in that year’s draft. He has played 634 total games in the NHL, 515 of them in Columbus, good for 3rd most in franchise history. In 2011, Rusty was traded to the Phoenix Coyotes in a 4-player deal and Jackets fans all around the great state of Ohio mourned the loss as if they had lost one of their own. Rusty was a fan favorite from day 1 and was the last player from the original roster to be traded away. Not only has R.J. Umberger been a fan favorite as a Blue Jacket, but true hockey fans will remember as far back as 2000-2001 when he played with Ohio State University for his college career. As many gifted college players do, he left early for the lure of the NHL when he was drafted by the Vancouver Canucks at number 16 overall in 2001. Umberger was later traded to Philadelphia where he spent a year with their AHL team the Philadelphia Phantoms and 3 years with the big club. After being traded to the Jackets he has been one of the more beloved Jackets in their short history. Before the strike-shortened 2013 season “Umby” had 4 consecutive 40 point seasons, including a career high 57 points as he played in all 82 games in 2010-2011. 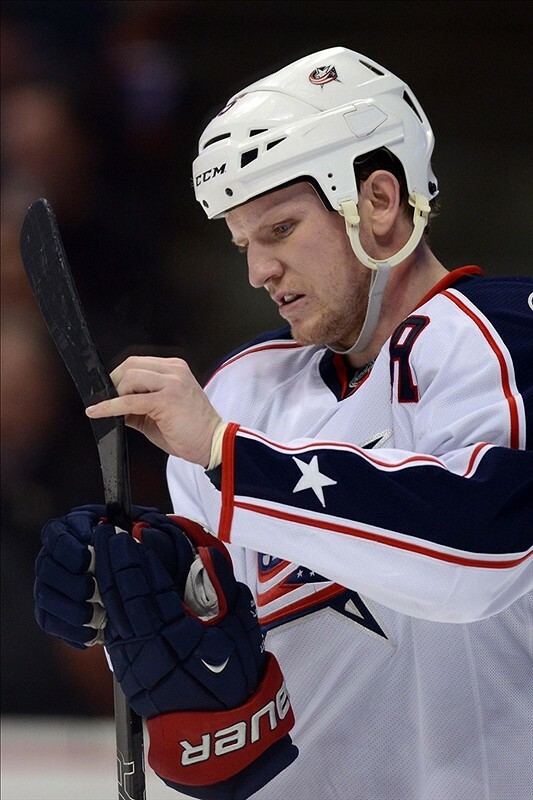 He has tallied a total of 216 points and 174 PIMs in his time in Columbus. Can a list of the best Blue Jackets really end with anyone else? Rick Nash was the Jackets’ #1 overall pick in the 2002 NHL Entry Draft, ahead of guys like Alexander Semin, Pierre-Marc Bouchard and Duncan Keith. Over the course of the last 11 years, he has proven his worth as a number 1 overall pick, scoring 100 more goals and 147 more points than the next closest 2002 draftee (Semin). After 10 years, Nash started to get bored, however, and you could see it in his on-ice play that dwindled off a touch. Having been drafted as an 18 year old and being the face of the team for so many years, he had come to the point in his career where he was done being the face of a losing franchise. In his best season, the 2008-2009 campaign, he led the Jackets with 40 goals and 39 assists, and led the team to their first and only Stanley Cup Playoffs appearance. But the time came in 2012 where he wanted to win. And can you blame him? Nash scored 42 points in 44 games in New York this year, and at age 29, he will continue to be a force to be reckoned with for years to come. David Vyborny – Second all time in Games played, and tallied 317 total points – 2nd all time to Nash’s 547. Fuel to the fire to put Nash at #1. So there you have them: the best Columbus Blue Jackets of all time. In Columbus, there is talent on the ice once again. With veterans Gaborik, Horton, Artem Anisimov and Jack Johnson to go along with the young guns Cam Atkinson, Matt Calvert, Ryan Murray and a Vezina Trophy winner in net, there are hopes that the 2013-2014 team will return to the playoffs. In another 7-10 years, it will certainly be interesting to see what this list looks like with a few playoff runs behind them.